Sustainability and societal responsibility drive us and lie at the heart of everything we do. Since 1958, we have financed thousands of operations around the world and provided risk financing for SMEs across Europe. Our ultimate goal is to improve the lives of people, support innovation and foster job creation. We make available financing to meet global challenges such as providing clean water and sanitation, reducing threats to biodiversity, enabling adaptation to and mitigation of climate change, and contributing to achievement of the United Nations Sustainable Development Goals (SDGs). The EIB Group considers the 17 SDGs essential for a safe and secure future that brings prosperity, inclusiveness and human rights for all. We are committed to helping finance the 2030 Agenda, which is built around the SDGs and includes a series of measures aimed at improving the lives of people around the world. Delivering an economy based on knowledge and innovation. Promoting an economy that is more resource-efficient, environment and climate-friendly and globally competitive. Fostering a high-employment economy that results in social and territorial cohesion across the EU. The EIB appraises and monitors all the investment projects it finances on the basis of their sustainability credentials such as environmental, social and governance aspects. To receive EIB financing, all projects supported must meet EIB environmental and social principles and standards (see below). Certain activities are completely excluded from EIB financing and are rejected from the beginning. Furthermore, we perform a separate economic appraisal of our investment projects to assess the costs and benefits to society as a whole. This economic appraisal takes account of all resources needed, whether human, technological, or natural, often using shadow prices, including for carbon, and gauges the value generated for all stakeholders, to determine whether society at large benefits from the investment. For our Carbon Footprint Exercise, we estimate and report the greenhouse gas emissions from projects where emissions are expected to be significant. We apply our carbon footprinting methodology to all sectors, beyond our climate mitigation projects. Only projects that fulfil both our financial and sustainability due diligence can be financed by the Bank. In accordance with the EIB Statement of Environmental and Social Principles and Standards, every beneficiary of EIB financing must meet clear requirements for the environmental and social aspects of their projects. The principles and standards are implemented based on the Bank’s Environmental and Social Handbook, which describes our due diligence processes involved in lending decisions and lists the ten standards that investment operations financed by the EIB must comply with. In 2017, the EIB launched an e-learning course providing the required knowledge and skills to implement its EU-based environmental and social standards. The course suits the needs of anyone interested in integrating environmental and social dimensions to ensure sustainable investment projects and is available free of charge. The EIF uses monitoring and an independent risk management function to ensure sustainable and compliant business operations. In 2017, it furthermore adopted ‘Environmental, Social and Governance Principles’ which underline the EIF’s commitment to responsible and sustainable business practices. The EIB’s climate action and mainstreaming of climate considerations in all Bank activities is driven by the ongoing implementation of our 2015 Climate Strategy. In addition, the EIB Group Gender Strategy aims at embedding gender equality and specifically women’s economic empowerment in the Group’s activities inside and outside the European Union. In line with the EU Agenda for Change, we are guided by the UN Sustainable Development Goals, working towards implementation of the 17 goals to end poverty, protect the planet and ensure prosperity for all. We are also committed to playing a key role in achieving the goals of the Paris Climate Agreement. The EIB Group’s operations are guided by the principles of transparency and accountability. We promote openness on how we work and implement EU policies, through a constructive dialogue with a wide range of external stakeholders, and – for the EIB – by publishing project-related environmental and social data in a public register of environmental information, in application of the Aarhus Convention. ☑︎ We also have a robust framework in place for compliance and ethics designed to address compliance risks. We operate a zero-tolerance policy on corruption, fraud, money laundering and the financing of terrorism. In cases of alleged maladministration on the part of the EIB Group, our Complaints Mechanism provides a resolution tool for members of the public. If complainants are not satisfied with the outcome of the process, they can go to the European Ombudsman. ☑︎ This makes our grievance mechanism unique as an international financial institution. We also seek to embed best employment practices and we are proud to have a low turnover of employees. The EIB was invited to participate as an observer and technical advisor in the High-Level Expert Group on Sustainable Finance (HLEG), established by the European Commission in December 2016. The objective of the HLEG is to provide recommendations for a comprehensive EU strategy on sustainable finance. The final report of the HLEG was published in January 2018. In this context, the EIB has coordinated the creation of a classification of climate action activities, starting with climate change mitigation. The future official EU classifications for sustainable assets in climate change and Environment finance should help policymakers express their policy goals and priorities in the same language used by the markets, to clarify their national transition trajectories (and any related incentives), and to communicate them to investors effectively. This classification would also provide investors with a description of what is sustainable in a clear, unambiguous and comparable way – while allowing them to continue to invest in line with their own preferences. Another potential use of the taxonomy is to provide “a consistent starting point for standard-setters and product developers – for example, green bonds or research/index providers”. In our borrowing activities, we set standards in sustainable finance. We are committed to raising funds in the capital markets in a responsible and sustainable manner in order to support our policy goals. The EIB is one of the largest issuers of bonds in the international capital markets. We are also the world’s largest issuer of green bonds, which we call Climate Awareness Bonds. 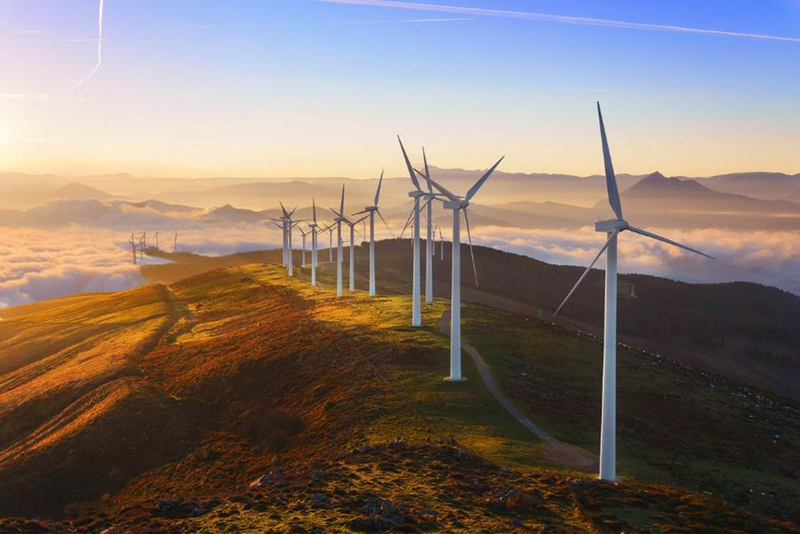 Climate Awareness Bonds offer investors a transparent link to the renewable energy and energy efficiency projects that benefit from the proceeds of our green bond issues. The climate benefits of projects are reported in great detail including impact indicators such as greenhouse gas emissions avoided, absolute emission levels, energy consumption saved and additional power generation installed. This report was prepared in accordance with the Global Reporting Initiative (GRI) Standards ‘comprehensive’ option and should be read in conjunction with the ‘Sustainability Reporting Disclosures 2017’, a separate document available on the EIB website. The 2017 Sustainability Report provides an overview of the operations and impacts of the EIB Group as they relate to our objective for supporting smart, sustainable and inclusive growth in a challenging European and global context. As a GRI GOLD Community member and part of the GRI Standards pioneer programme, the EIB Group has been one of the first international financial institutions (IFIs) globally to apply these standards. Our ‘Sustainability Reporting Disclosures 2017’ address relevant topics in a standardised form that makes them more comparable for our stakeholders and professional users of sustainability reports such as financial and ESG analysts, non-governmental organisations, and members of the academic community. The relevance of the topics disclosed stems from the materiality analysis conducted in 2013/2014 in cooperation with external and internal stakeholders, who identified the EIB’s material sustainability topics that were rated with a high level of importance to the participants (see Sustainability Report 2014, p. 10). The present report features three dimensions of sustainability at the EIB Group: ‘Responsible Investment’ covers our investment and lending operations; ‘Responsible Guidance’ demonstrates how we ensure responsibility and sustainability in carrying out our operations; ‘Responsible Institution’ is all about how we live up to our standards internally. An additional section deals with specific focus issues and initiatives in 2017. The EIB Group commissioned its external auditors, KPMG, to provide a limited assurance report on selected statements and figures in the Sustainability Report. These are marked with ☑︎ and highlighted in italics. We trust you will find the information in this report interesting and informative. We welcome any comments or questions you may have and invite you to address them to csr@eib.org.